If you’re an European tech start-up looking to get business funding, you now have a very good place to start. 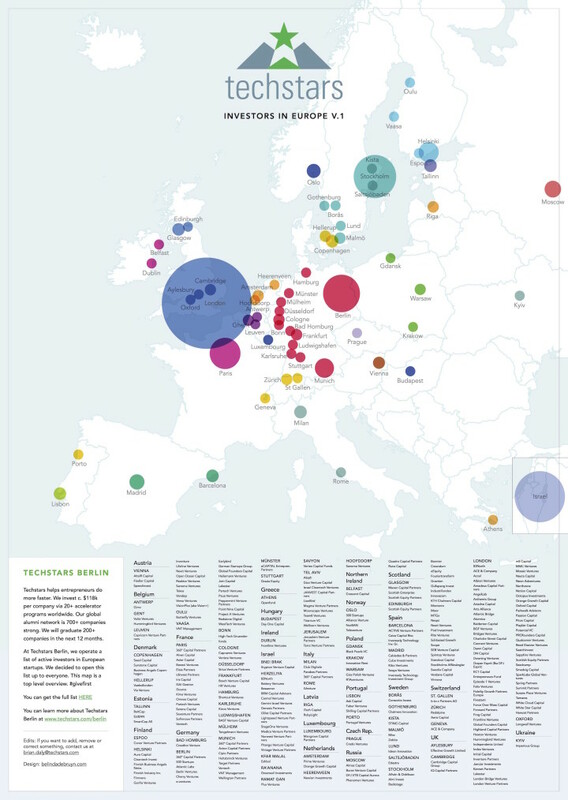 Techstars Berlin has designed and created one of the best resources for European start-up entrepreneurs in search for business funding: an investor map that features more than 300 investors who routinely invest in Seed, Series A or Series B rounds in European startups. The list of investors totals more than €15bn in funds, which are currently available for investments in European startups. The complete list of investors is publicly available and comments are reviewed by the team for potential additions and corrections, because it is a work in progress and the aim is to continuously update the list in the coming months. Techstars is a mentorship-driven start-up accelerator that holds 13-week programs for start-ups in various cities around the world. Techstars invests around $120k per company via more than 20 accelerator programmes worldwide. If you are interested to find out more about Techstars Programs, you can pre-apply for Techstars Berlin here.